This easy, quick, comforting, and delicious Chana Dal - Split Chickpeas Soup is cooked with ginger, garlic, onion, tomato and flavored with cumin garlic tempering, which makes it into a smooth soup. Plus, gluten-free and vegan. You can make it in an Instant Pot, Stovetop Pressure Cooker, or in a Saucepan. Cook this healthy and satisfying chana dal for any weekday meal. 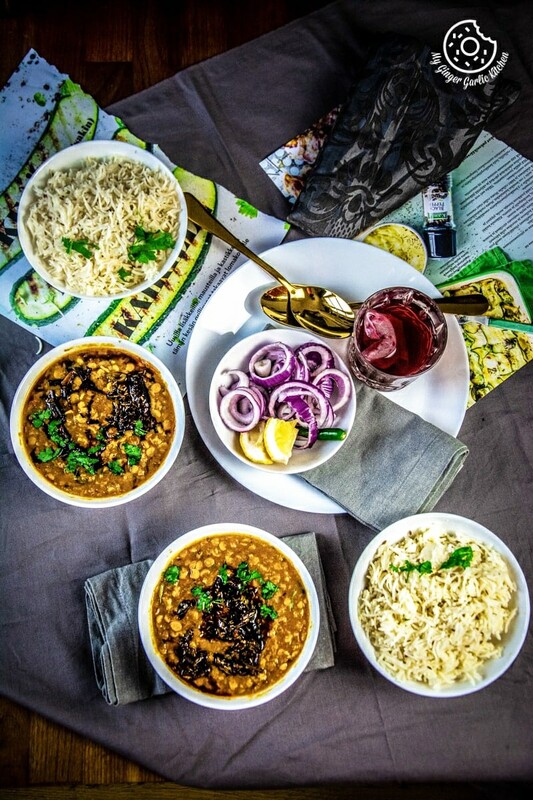 Lentils and beans dishes have been a staple in every part of India for centuries. Dal is made in so many different ways. All Dal Fry dishes are very popular because of the following reason. Dals are generally light on the stomach and they are easy to digest. Plus, creamy dal dishes taste great when combined with caramelized onions, tomatoes, ghee, and spices. 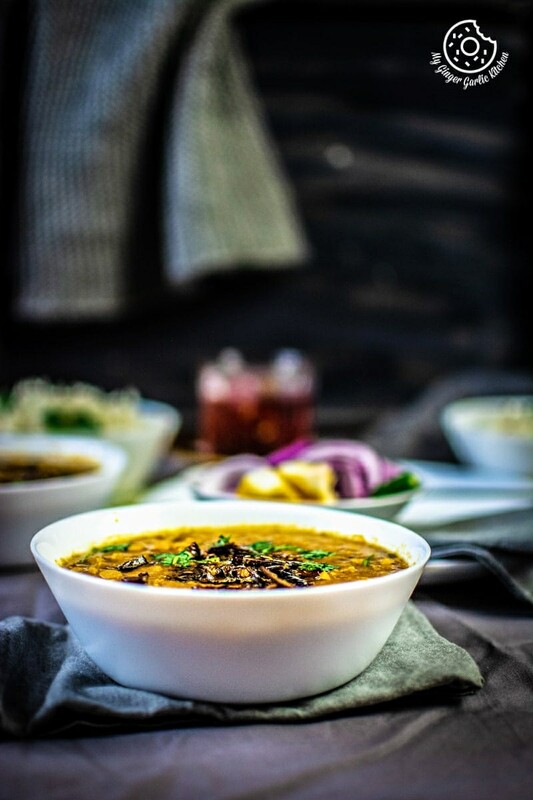 The amalgamation of all of the above ingredients makes dal dish so delectable and flavourful. Chana Dal or Chane ki Dal is dried brown chickpeas that have been split and skinned. Chana is actually nothing more than split chickpeas, or garbanzo beans. It is also called Split Chickpeas or Bengal Gram. Brown chickpeas is called kala chana in Hindi. Since this split chickpea is made out of dried brown chickpeas, it has the same nutty texture. What are the health benefits of Chana Dal? Chana Dal is packed with many nutrients. This dal has an excellent source of vegetable protein and is rich in fiber. Chana Dal has a low glycemic index — thus this is diabetic friendly too. What is Chana Dal Tadka? Chana Dal Tadka is a lentil based spicy soup which is served as a side dish. 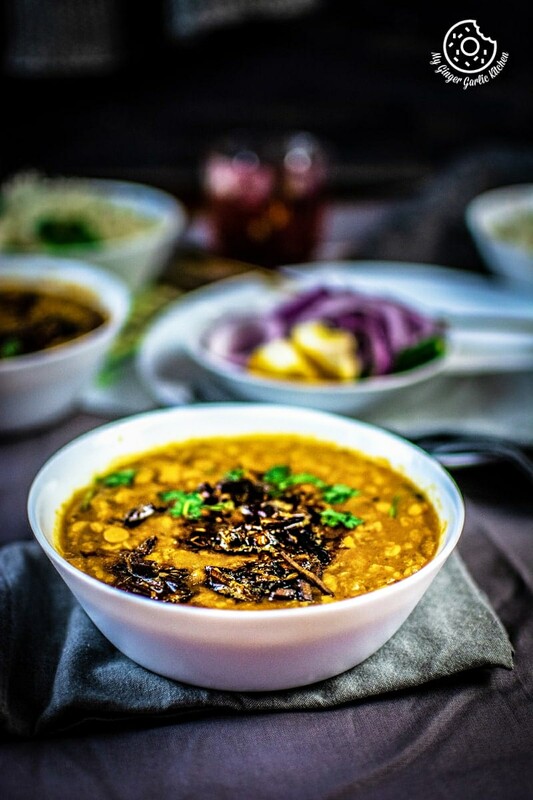 In this chana dal tadka recipe, split chickpea or Bengal gram lentils are cooked with onion tomato masala and then tempered again with some garlic and chili powder. How to cook Chana Dal in a Pressure Cooker? Rinse chana dal and soak for 30 minutes. Heat oil in a pressure cooker over medium Heat. Add cumin seeds and cloves to it. Once the cumin seeds start to change color, add the onions and sauté for 2 minutes. Add chopped tomatoes and stir well. Now add chopped green chilies, crushed ginger and crushed garlic to it. Mix everything well and cook for 2 minutes. Add red chili powder, turmeric powder, coriander powder, and salt. Mix everything well and cook for 2-3 minutes. Add rinsed chana dal and 3 cups water to it. Close the lid, and pressure cook on high for 8-9 whistles. Let the pressure go down completely before opening the lid. Once pin drops, open the lid. Mash dal lightly using with the back of spoon or a potato masher. Add garam masala powder and mix well again. Cook for 2 minutes. Add cilantro leaves and mix well. How to make Chana Dal recipe without a Pressure Cooker? Chana dal recipe can be cooked on the stovetop without a pressure cooker. However, it would take a longer time to cook, if you are making it in a stovetop pot. Also, you need to keep an eye on it while cooking. I personally prefer using my Instant Pot or stove top pressure cooker for making any recipe where I need to use boiled chana dal. How do you make chana dal in a saucepan? Rinse chana dal well and soak it in 3-4 cups of water for about 1-2 hours. Longer soaking time is recommended when you are making dal on the stovetop. This would make things go faster. Make onion tomato masala, and add soaked chana dal to it along with water. Cook chana in a heavy bottomed pot and let it come to a boil. Once boiled, cover the pot, let it simmer for about 30-40 minutes or until done. Keep checking it in every 10 minutes, and add more water if required. The cooked chana dal should be soft after cooking. To check, press chana dal between your finger and thumb. If dal turns mushy easily, that means chana dal is cooked properly and will be easy to digest. 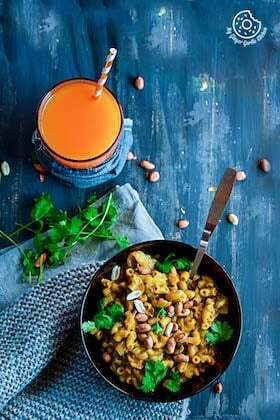 How to cook Chana Dal in an Instant Pot? Cooking Chana Dal in an Instant Pot is very simple and fast. For cooking chana Dal in Instant Pot, start the instant pot in sauté mode and heat oil in it. Add cumin seeds and cloves to it. Once the cumin seeds start to change color, add the onions and sauté for 2 minutes. Add chopped tomatoes and stir well. Now add chopped green chilies, crushed ginger and crushed garlic to it. Mix everything well and cook for 2 minutes. Add red chili powder, turmeric powder, coriander powder, and salt. Mix everything well and cook for 2-3 minutes. Add rinsed chana dal and 3 cups water to it. Close the lid. Set the Instant Pot valve to sealing. Change the instant pot setting to manual or pressure cook mode at high pressure for 11 minutes. Let the pressure release naturally. Open the lid and give a good stir. Press the cancel button and then press the saute button. Mash dal lightly using with the back of spoon or a potato masher. Add garam masala powder and mix well again. Cook for 2 minutes. Add cilantro leaves and mix well. How to make tadka for chana dal? Heat ghee in a tadka pan over medium heat. Add cumin seeds and let them crackle. Add sliced garlic cloves, dried red chilies and cook till garlic turns light brown. Add red chili powder and give it stir. Fry for few seconds and remove from heat. Transfer cooked chana dal to a serving bowl drizzle with prepared tadka. Garnish with coriander leaves and drizzle with some lemon juice. 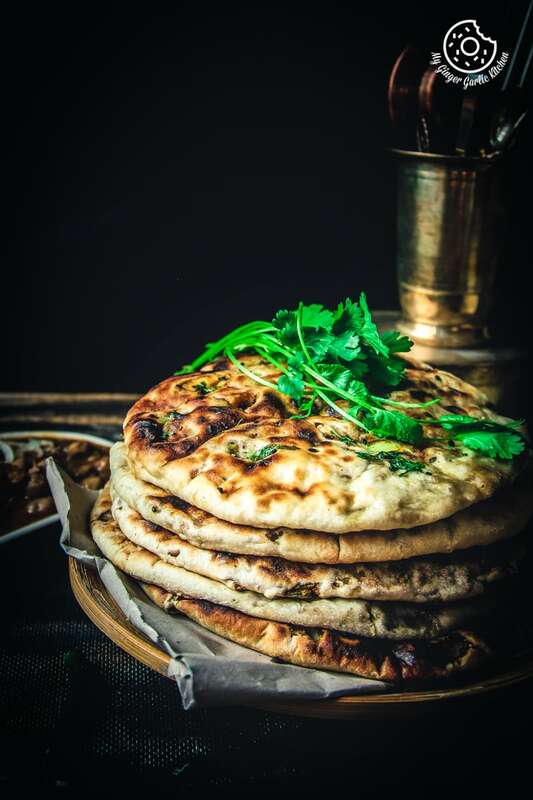 Serve chana dal hot with flavourful paratha and rice. What other lentils can I use for this Chana Dal recipe? 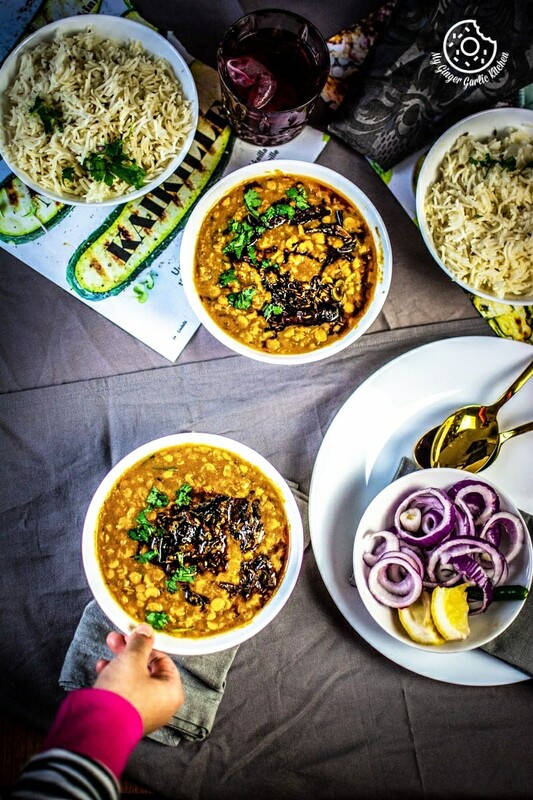 You can use any split lentils for this recipe such as tuvar dal (split yellow pigeon pea), masoor dal (split red lentils), moong dal (split and skinned green gram), urad dal (split and skinned black gram), etc. The dal must be split, so don’t use whole beans, as what you want is a creamy final texture. What is the right consistency of Dal? There is no perfect consistency for a dal recipe. Since dal is cooked in every part of India, thus, the recipes, their taste, and texture varies from one part to another. Every household like to eat dals in their preferred consistency. In some regions of India, dal is cooked very thin (watery) like soup, while in other regions, dals have semi-thick consistency. I always like my dal which is on the thicker side. So I only add 3 cups of water to 1 cup of chana Dal. What are the various types of Tadka (tempering) used in Dal recipes? Panch-phoran tadka: (5 spice mix mustard oil tadka which has fennel, carom seeds, fenugreek, onion seeds and mustard seeds). What is the difference between Chana Dal Fry and Chana Dal Tadka? Chana Dal Fry: In Chana Dal Fry recipe, either you boil dal and add tomato onion masala to the boiled dal, or boil dal with tomato onion masala. There is no second tadka in Chana Dal Fry. Chana Dal Tadka: Second tadka is a must for Tadka Dal. With this Chana Dal Tadka recipe you boil chana dal first with onion tomato masala and then make tadka and add it on the top. The second tadka which you add at the end draws out the strong flavors of garlic and adds a delicious aroma to chana dal. The second tadka is a must for Tadka Dal. How to make Chana Dal Fry? If you want to make Chana Dal Fry, then simply omit the second (tadka) tempering. Rest of the recipe is the same for Chana Dal Fry. Chana Dal Lauki: Add sliced bottle gourd to the chana dal while boiling. Chana Dal Patta Gobi: Add chopped cabbage to the chana dal while boiling. Chana Dal Palak: Add chopped spinach to the chana dal while boiling. How to serve Chana Dal? This chana dal goes perfect with steamed rice, roti, or any of of your favourite flatbreads on the side. To make it an elaborate indian meal, you can also pair it with some vegetarian curries such as: Aloo Gobi, Aloo Matar, or Palak Paneer. This recipe for Chana Dal Tadka or Spiced Split Chickpea Soup calls for little mashing. Traditionally, a mathani (traditional Indian wooden/metal hand blender/churner) is used for blending dals. Although you can also mash it with a potato masher, or with the back of a spoon like I did. If you don’t have a tadka pan, or want to make this chana dal entirely in the Instant Pot, then make the tadka (tempering) first and then simply follow the recipe. I have soaked chana dal for 30 minutes. If you are planning to soak it longer, then make sure you also reduce the cooking time. I have used ghee for my tadka. But if you want to make it vegan, then replace ghee with the same amount of oil. This easy, quick, comforting, and delicious “Chana Dal - Split Chickpeas Soup” is cooked with ginger, garlic, onion, tomato and flavored with cumin garlic tempering, which makes it into a smooth soup. 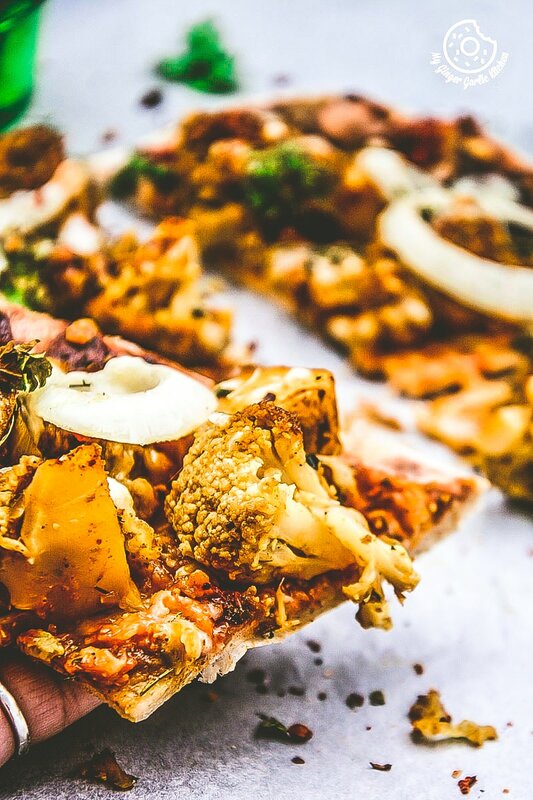 Plus, gluten-free and vegan. 1. Rinse chana dal and soak for 30 minutes. 2. Start the instant pot in sauté mode and heat oil in it. 3. Add cumin seeds and cloves to it. 4. Once the cumin seeds start to change color, add the onions and sauté for 2 minutes. 5. Add chopped tomatoes and stir well. Now add chopped green chilies, crushed ginger and crushed garlic to it. 6. Mix everything well and cook for 2 minutes. 7. Add red chili powder, turmeric powder, coriander powder, and salt. 8. Mix everything well and cook for 2-3 minutes. 8. Add rinsed chana dal and 3 cups water to it. 10. Close the lid, and set the valve to sealing. 10. Change the instant pot setting to manual or pressure cook mode at high pressure for for 11 mins. 11. NPR (Natural pressure release). Once pin drops, open the lid. 13. Press the cancel button and then press the saute button. 14. Mash dal lightly using with the back of sponn or a potato masher. 15. Add garam masala powder and mix well again. 16. Cook for 2 minutes. 17. Add cilantro leaves and mix well. 2. Heat oil in a pressure cooker over medium Heat. 9. Add rinsed chana dal and 3 cups water to it. 10. Close the lid, and pressure cook on high for 8-9 whistles. 11. Let the pressure go down completely before opening the lid. 12. Once pin drops, open the lid. 13. Mash dal lightly using with the back of spoon or a potato masher. 14. Add garam masala powder and mix well again. 15. Cook for 2 minutes. 16. Add chopped coriander leaves and mix well. 1. Heat oil in a saucepan over medium Heat. 2. Add cumin seeds and cloves to it. 3. Once the cumin seeds start to change color, add the onions and sauté for 2 minutes. 4. Add chopped tomatoes and stir well. Now add chopped green chilies, crushed ginger and crushed garlic to it. 5. Mix everything well and cook for 2 minutes. 6. Add red chili powder, turmeric powder, coriander powder, and salt. 7. Mix everything well and cook for 2-3 minutes. 8. Add rinsed chana dal and 3-4 cups water to it. 9. Let it come to a boil. 11. Mash dal lightly using with the back of spoon or a potato masher. 16. Add cilantro leaves and mix well. 1. Heat ghee in a tadka pan over medium heat. 2. Add cumin seeds and let them crackle. 3. Add sliced garlic cloves, dried red chilies and cook till garlic turns light brown. 4. Add red chili powder and give it stir. Fry for few seconds and remove from heat. 1. 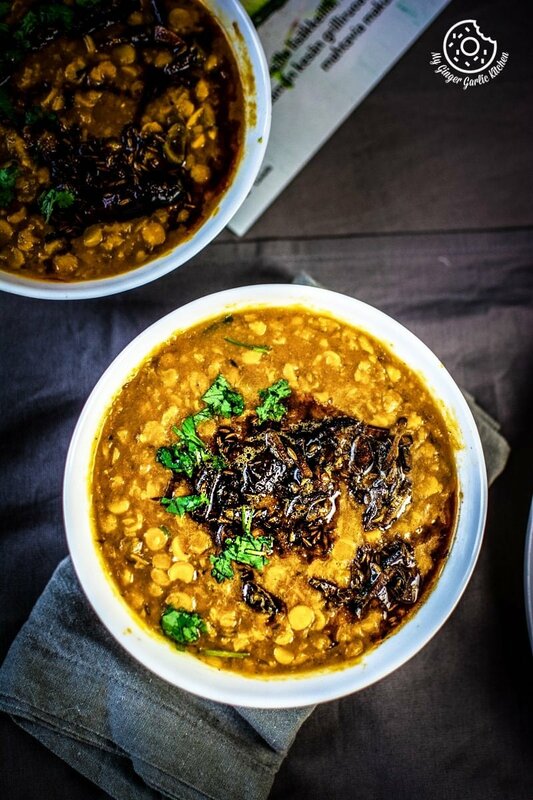 Transfer cooked chana dal to a serving bowl drizzle with prepared tadka. 2. 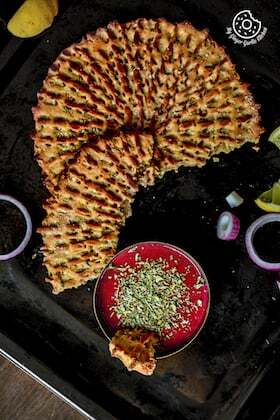 Garnish with coriander leaves and drizzle with some lemon juice. 3. Serve chana dal hot with chapati and rice. 1. If you don’t have a tadka pan, or want to make this chana dal entirely in the Instant Pot, then make the tadka (tempering) first and then simply follow the recipe. 2. I have soaked chana dal for 30 minutes. If you are planning to soak it longer, then make sure you also reduce the cooking time. 3. I have used ghee for my tadka. But if you want to make it vegan, then replace ghee with the same amount of oil.